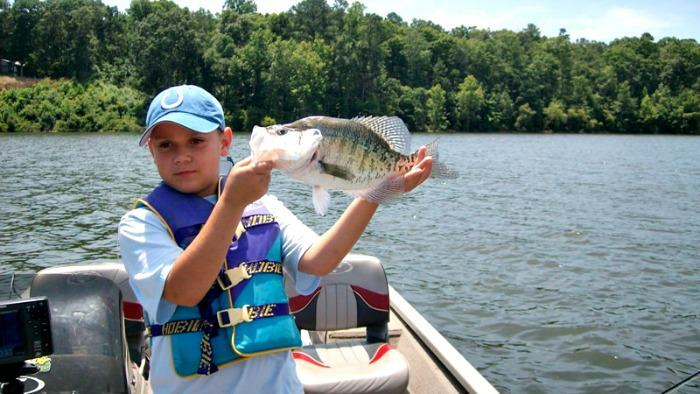 Summer crappie fishing is known to be quite tough by most fishermen standards. As the weather heats up, so do water temperatures. 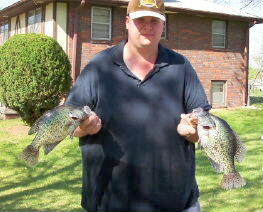 And when the water temperatures rise, crappie play hide and seek from the warmer water temps and head to deeper water. There aren't a whole lot of fishermen who are great at fishing for crappies down deep in the water column. It's especially unfortunate for those without a boat and are restricted to fishing from the shoreline. But, with just a little ingenuity, summer crappie fishing can be just as exciting and rewarding. 2) Incorporate the following three tactics into your game plan and go home with a stringer full of panfish and a smile on your face. It's most common to target crappies around brush piles and other types of structure in deep water during those hot days of summer. However, there are good times in the summer when big crappies can be corralled from shallow water flats too. Shad normally spawn continuously in those shallow flats, and of course, mister crappie will sure be around looking for an easy meal. Look for crappie to be holding on any one piece of cover, at any given time and day. The less cover, the better, and the easier your chances might be at ringing them up. 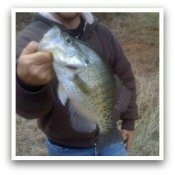 The normal every day crappie fisherman will often stick to using just one or two of their favorite crappie baits, such as the ever-so-popular crappie jigs, and the all time faithful minnows. Don't be afraid to try something different or completely new. Drop something else out there, especially if what you're using isn't working. Try small spinner baits, little crankbaits, or switch from a minnow to some freshwater shrimp, or even just a night crawler. The crappie summer bite can be a little on the light and finicky side. So, you may have to use a more tactical approach with your presentations. A super sensitive float, such as a Thill's Shy Bite float, properly paired together with ultra-light tackle rigged with 2 to 4 pound test fishing line, is one way to detect those little ticky tack nibbles. Add just enough weight below the float to allow no more than half an inch to appear above the water. Awareness and patience is key here. Set the hook immediately at the first sign of the float rising above the water. You may also want to try an unweighted bait on your hook. I've had quite a bit of success with this presentation, especially in slow moving to stagnant waters. And it's about as easy as it can get. Simply toss it out there into the water around your preferred target area. The minnow will thrash around on the surface for a couple minutes before it begins to settle below. Then wait until you feel anything unusual and set the hook. Don't let the hot weather discourage you from getting after those fun fighting panfish. Enjoy summer crappie fishing by trying out new tactics and techniques that the average angler wouldn't dare to. Keep an open mind, open your tackle box, experiment with unconventional stuff, have fun, and slay some big slabs of crappie!